I'm not necessarily sure if these posts are necessary, but I wanted to share how I'm losing weight to inspire others to find ways that work for them too! Overall, I just count calories. My limit started out at 1230 a day, and once I lost the first 10lbs the myFitnessPal app dropped it to 1200 a day. Yes, I keep a copy of it stuck to my monitor. 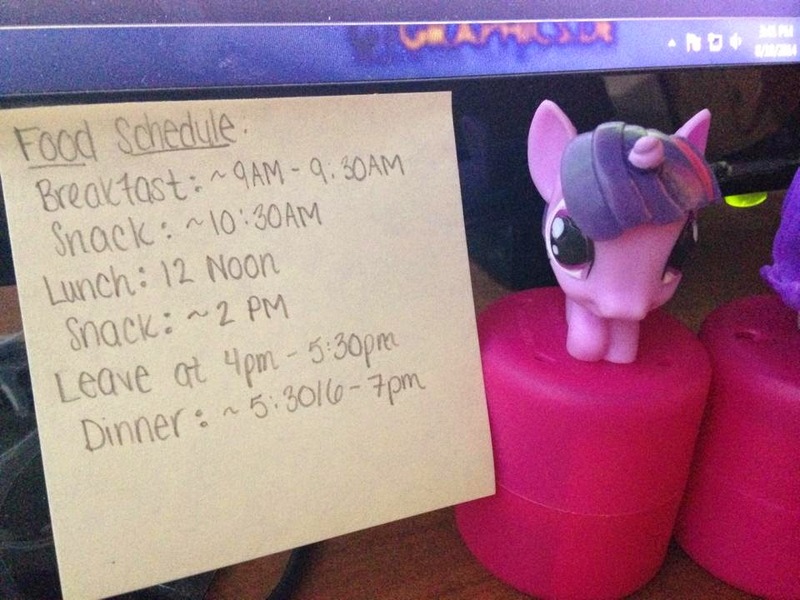 Also, ponies on my desk. Food Schedule: I haven't really changed too much. I'm more or less just /very/ conscious of what I'm putting in my body now. And I keep the same food schedule almost everyday. Dinner always fluctuates based on what time I leave work. And sometimes I eat breakfast at home when I have enough time in the morning. Otherwise, this is the Food Schedule I stick too. Typical meals for me are pretty routine, and I'm a creature of habit and have no problem eating the same things and only changing them up a little bit before I get sick of them one way and not the other. I love yogurt and chicken, & I made basic changes from things I would usually eat beef for to chicken or turkey. I also bake a lot of foods now vs. frying them. And have amped up the amount of greens I eat. I'll be posting about this all week long so keep on the lookout!